Sendai, the biggest city in the Tohoku region, is surrounded by the sea, mountains, and rivers. It is a healthy city in harmony with nature. Sendai was founded by the well-known Japanese samurai, Masamune Date, during the Sengoku Period. 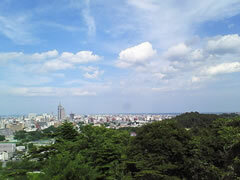 Sendai is known as both a college town and "the City of Trees". There are many historical sites in the city, so while getting a taste of tradition and culture, you will also notice new developments for Sendai in the 21st century. There are many festivals during the year - ones to note are the Sendai Aoba Festival in spring, the Sendai Tanabata Festival in summer, the Jozenji Street Jazz Festival in autumn, and the Sendai Light Pageant in winter. There are many fashionable stores located along the tree-lined streets of Jozenji Dori, Hirose Dori, Aoba Dori, as well as on the pedestrian deck that joins Level 2 of JR Sendai Station's West Exit to Parco. Sendai is also the home of several professional sporting teams, notably the Vegalta Sendai soccer team, the 89ers basketball team and the Tohoku Rakuten Golden Eagles baseball team. This is a building located at the west exit of Sendai Station, with nine aboveground levels and two basement levels. There are more than 150 stores for fashion, interior furnishings, accessories, and restaurants in one place. It is a new landmark in Sendai and is considered by many to be the most popular, fashionable, and trendy place to be. Sendai is the birthplace of grilled beef tongue. There are many restaurants specializing in beef tongue in the city. On level 3 of JR Sendai Station, there are four restaurants side-by-side, making this "Beef tongue street" and it is very popular with the people of Sendai and tourists alike. On the opposite side is "Sushi street". This is a store that stocks approximately 70,000 items, from lifestyle goods to interior furnishings and variety items, located at the west exit of JR Sendai Station. Health products are sold on the 2nd floor. On the 6th floor, you will find Mujirushi (household goods store) and HMV (music and movie store). On the 7th floor, Junkudo bookstore. The 8th floor has a number of restaurants and beauty salons. The proper name for this stadium is "Kleenex Stadium Miyagi" and it is the home ground for the Tohoku Rakuten Eagles baseball team, a professional team in the Japanese Pacific League. Around the stadium, there is a plan to make it more like a ball park, and there are a number of attractions and events located nearby.